OTTAWA – The thought of a freshly-cut Christmas tree to start the holiday season had many families out this weekend on the hunt for the perfect spruce or fir. Ottawa-area tree farms and lots have been abuzz with tree-seekers taking advantage of the mild winter weather. 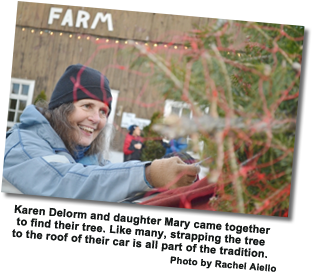 “We have an artificial tree in our basement but this year we decided to go for the real thing,” said Sarah Kuback, who with her husband and two children was bringing a home a tree from the Fallowfield Tree Farm to decorate on Sunday night. “It’s nice to be able to support the local farmers,” added the dad, Chris Callander. For many young families who ventured out on Sunday, it was the first time cutting down their own tree. “We always get a real tree. Usually it’s just from IKEA, but with the young ones now we wanted to do the whole family experience,” explained Bryan Gibson. “It’s fun to cut down a tree. It’s an adventure and a really good experience to come with family,” said 13-year-old Bennett Schmaltz. He was with family and friends looking for the right tree. Others were more enthusiastic: “It’s about the smell, and the tradition,” said Shelia Hodges. As for what the family was seeking in a Christmas tree, son Jamie Hodges said they were looking for a seven-footer that was nice and thick. Luckily, full trees are in plentiful supply thanks to favourable weather this season, according to Fallowfield Tree Farm owner Kenny Stuyt. “We have a range of trees, big and tall – not all perfect form, you know? But people aren’t really too picky,” he said. Fallowfield Tree Farm farmhands Anette Shonkier and Keegan Gilchrist say the season has so far been busier than anticipated. Gilchrist said this past weekend and next are usually the go-to times for tree seekers. The most popular? “Fir trees! Because the needles stay on past New Years… and they have a better smell too,” said Stuyt. For anyone planning on picking up a tree this holiday season, anticipate spending anywhere from $20 at chain store lots to $120 at locally owned lots. Canadian Christmas Tree Growers Association estimate one million Christmas trees are expected to be purchased this season. To make the pictures larger, click on any of them… then, to advance the short slide show, , use the "Next" and "Previous" buttons which will appear in the upper right corner of this page (these files are a wee bit large, so they may take a few seconds to open).